Having got over that I decided, wouldn't it be cool to see my Bat Storm cast interpret the audio from the official Dark Knight Trailer. Rather than using my cast to try and recreate the trailer scene for scene I thought perhaps I could slant my interpretation towards some of the ideas I have for my Bat Storm series. In the end my final trailer is a wrestling match between the two. Some of it borrows from my Bat Storm series whilst other parts are very similar to what actually appears in the official trailer. Through out I peppered my trailer with a few visual 'Easter Eggs' for those of you that notice the little details. My final entry to GoAnimate's Summer Blockbuster competition is embeded below and not only do I consider it some of my best work on GoAnimate but also it's changed my vision somewhat from what my Bat Storm series was initially intended to be. More about that after you watch the trailer. If you've seen my two earlier Bat Storm previews you'll know that at the time they were made Bat Storm the series was looking very much like a sit-com - probably along the lines of American Dad - rather than block buster movie. Through the process of making this trailer I've come to realise that the GoAnimate studio is capable of creating real cinematic action. Tracking shots of moving vehicles as if you're following from behind, vehicles exploding as they hurtle towards you and, even simple shots of the front of a building exploding are all within the studio's capabilities. It's even possible to really breathe more dramatic life into GoAnimate's Comedy World Characters through creative use and tight cropping of their sometimes 'wooden' actions and limited facial expressions. (Which is not a criticism it's just that they're often animated poorly by less experienced GoAnimators). Consequently my work on Bat Storm, the series, has stalled as I kind of mull over the possibilities. Getting back to the behind the scenes stuff on my Bat Storm trailer... from the moment I matched up a bus pulling away from the kerb with the sound of the Bat Pod racing through Gotham's streets I knew I was onto something with this idea. Then Bat Storm Smashing in a Convenience Store door matched with the sound of Batman landing on a car roof, from a great height, breaking the windscreen just sealed it. I had to keep going. I can't even begin to count how often I watched my animation back as I was making it. Checking over and over to make sure the audio matched with the visuals perfectly with every new scene I added. GoAnimate's studio feature for listening to an audio clip from any point in your animation timeline was next to useless. I can't see how anyone finds that helpful? The only way to check is to preview your entire animation. When I released the trailer it had 61 of my own views on it but I watched it countless times more than that inside the studio and hitting replay over and over. One thing that I did copy directly from the official trailer was the use of the black screen pause. Every so often the official trailer throws up a black screen for a few seconds whilst you listen to some audio - usually some salient words by the Joker - for dramatic effect. From my point of view that dramatic effect meant a few less seconds that required animation. The trailer itself only took me about a week and a half of on and off working on it to complete, which is a short time for me. Admittedly I did spend nearly 16 hours of one weekend finishing it off but much of the shorter time I can attribute to some luck where things just worked first time. For example, the "Why so Serious?" scene with the Jokester (In Bat Storm he's not called 'Joker') pulling back Bat Flashes head and uttering those famous words. I set this shot up once, ran it through, and it worked. The only thing I had to adjust was the scene length to match the audio. That particular scene demonstrates perfectly how, with creative cropping of the characters, you can suggest new actions. If you look at the whole scene (pictured right) you can see the Jokester pointing past Bat Flashes head and Bat Flash taking a fearful step back. 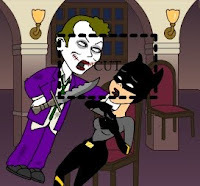 With the tight cropping of the scene it seems like the Jokester is pulling Bat Flashes head back and threatening her with a knife (that he isn't even holding). 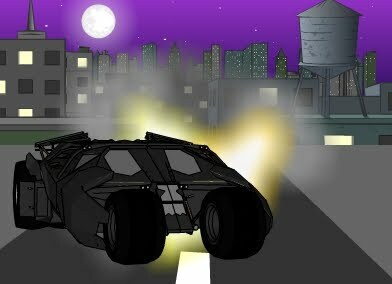 Based on feedback people are often wowed by my trailer and I wonder if they see some of the more humorous aspects such as Bat Storm hanging from the roof in a bar, then falling to the floor, juxtaposed with the very next scene of the Tumbler crashing into a building... a bit of drink driving perhaps? Or the scene with Gordon and the Commissioner talking about their latest captive who turns out to be a teenage boy, taunting them from the jail cell, when you thought they were discussing the Joker. Then there are the Easter Eggs that I scattered throughout. Nods to some of my past animations. Happy Bunny, Havock, Rashy, Harry Chalk, Peter Griffin and the Tank from Happy Bunny Versus Ken are all in there. Incidentally, if you can read what Happy Bunny is spray painting, that came about because, of all my CC Characters, I think Bat Flash is seriously the hottest and the coolest at the same time! There are three props that really are the stars of my trailer after the characters themselves. The first is the Underdog wall smash (pictured right). Blink and you'll miss it but on almost every single crash and explosion you'll see a couple of bricks fly out of nowhere as a gaping whole is ripped into whatever wall just got destroyed. It really is one of the most useful official GoAnimate props from any theme on the site. See if you can count how many times I've used it. The second is a custom explosion created by GoAnimate's Product Manager, Nicolas. There is another more cartoon like explosion that other GoAnimators seem to prefer but I like this particular one because you can use it for any size explosion and you can use it multiple times in the same explosion to make an even larger fireball. Notice how I use it in the scene with Rashy giggling as the wall behind him explodes. One small explosion that blows the first hole in the wall then two bigger ones that tear out the bottom of the wall. The third is the Tumbler (pictured right along with the previously mentioned explosion prop) created by GoAnimate's Flash animation legend, Reddplague. Not only is it a great animated prop (it is in fact about five props featuring different views of the one car) but Redd's foresight in creating a bottom view gave me a lucky break. The scene in my trailer where you see the Tumbler explode and flip was another shot that I set up once and it just worked with very little adjustment. For me it's a real highlight and wouldn't have been possible without such a great prop. Since its release on the 19th of July my Bat Storm trailer has been well received and has even edged into the top twelve of GoAnimate's Top Animations list of all time (two spots behind Harry Chalk 2 which is slowly dropping after three months in the top twelve). I doubt it's going to win the competition. I'm pretty certain on which entry I think will take out the grand prize but maybe I have a shot at one of the stats based prizes like most viewed or most shared. I guess we'll find out when the competition closes on August 19, 2010.
you know it's well animated (or at least, a lot of work was put into it) when you have 50+ of your own views. It's funny how we put silly rules on ourselves, isn't it. I usually feel the same way about ripping off someone else's memes, or youtube videos in general. But as long as we're making something new, we really shouldn't feel weird about it. I make stupid rules for myself all the time. I starting to break them more often when I'm drawing and animating. Nice insights into making your Bat Storm. Good Luck in the contest. I think for me it's just a personal preference. I like to think I'm watching something original when I watch other GoAnimators work. It's a bit of a let down when they've obviously ripped audio or imported something else that's clearly not their own. Hence I don't like to do that in my own work. But then again... GoAnimate is a complete 'mashup' kind of site. That's what makes it so good. I wouldn't have given it a second thought to use Redd's Bat Tumbler on any of my animations. Why should adding someone else's audio be any different?